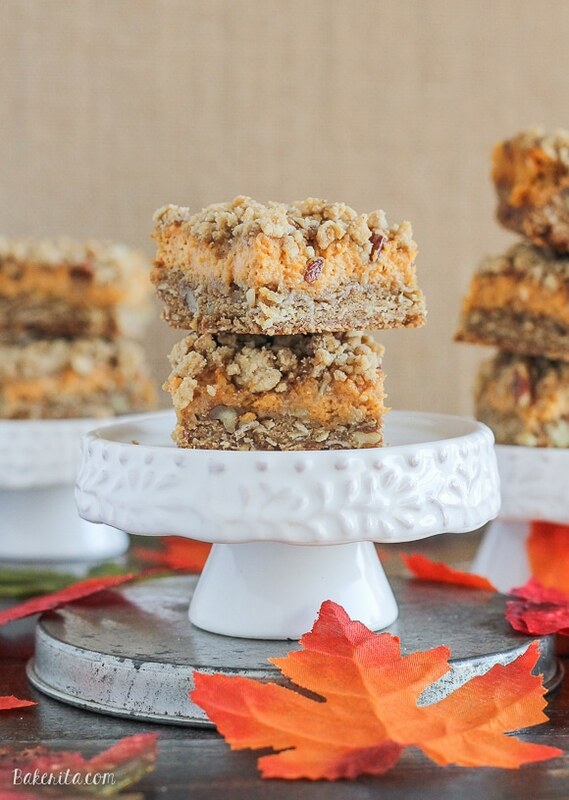 These Pumpkin Cheesecake Crumb Bars have a crumble crust full of oats and pecans with a creamy pumpkin cheesecake filling. 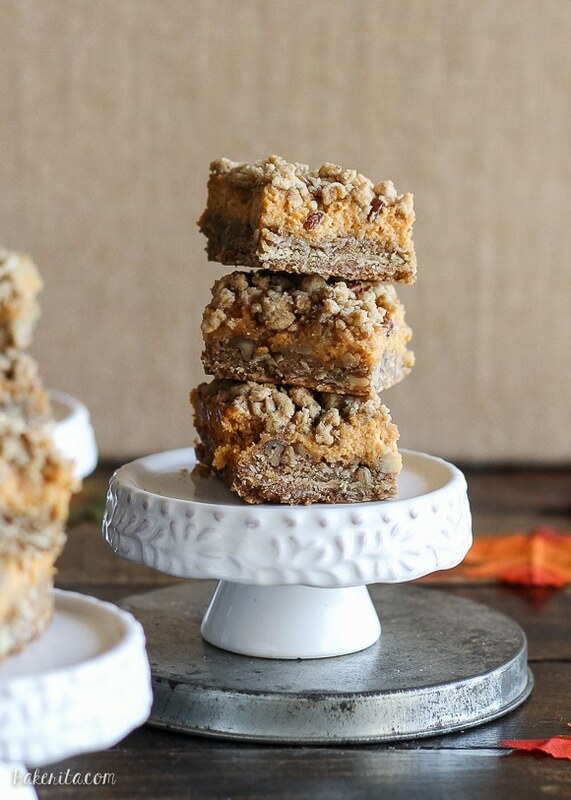 This recipe is an irresistible fall treat! For a few days this week, my entire apartment building smelled like pumpkin spice. I have been putting pumpkin into ALL of the things. It started by choice, and then I realized that I had opened a Costco-sized can of pumpkin and had way more pumpkin than I needed to get through with the two pumpkin recipes I had lined up. So…I made the recipes (both coming soon!) and still had more than half a GIANT can left. So I started thinking of more pumpkin recipes, scouring my scrawled recipe brainstorming lists, and soliciting recipe ideas from my Instagram followers. 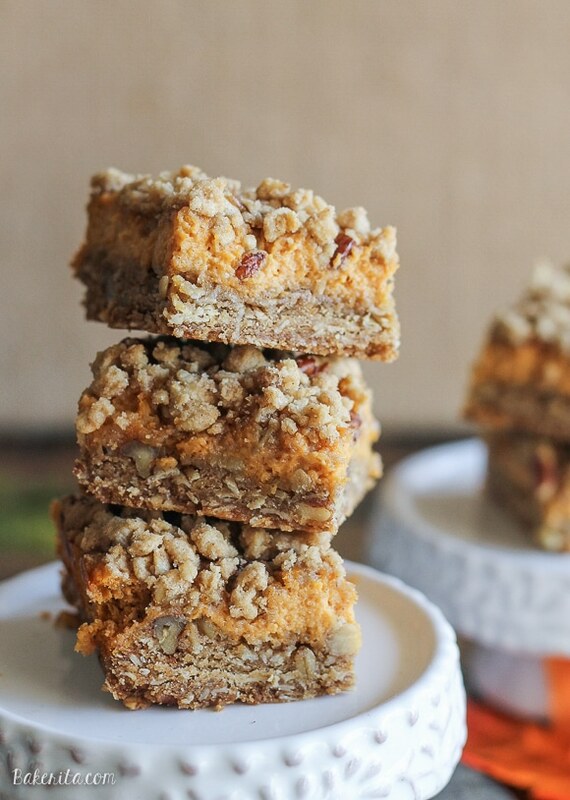 I ended up with a ton of drool worthy, inspired pumpkin ideas and after scouring my pantry and fridge for what ingredients I already had, I decided my next pumpkin treat was going to be these Pumpkin Cheesecake Crumb Bars. Oh my goodness, this was the best result of extra pumpkin I could’ve though of. These might have been an unplanned recipe, but it’s definitely a winner. As with most of my crumb bars, this recipe uses the same crumble for both the crust and the crumble topping. I can never be bothered to make two separate batches for a crust and a crumble, because bars are supposed to be easy. Nobody has time for that. I got your back. The crumble is full of hearty, warm fall ingredients. It’s sweetened with dark brown sugar to give the crust a more caramelized flavor. Oats make the bars extra hearty and add some texture to the crust and crumble. By adding cinnamon and nutmeg to the crust and filling, we get warm fall spices in every morsel, and the pecans add a bit of crunch that I love. I’m a huge fan of pecans (and nuts in general) but I know some people are not fans of nutty desserts, so if you want, just leave them out! The recipe will flourish even without them. The pumpkin cheesecake filling is quick to make. After baking, it’s the perfect rich and creamy counterpart to the crunchy crust and crumble. It’s well spiced, smooth, and a guaranteed hit for the cheesecake and/or pumpkin lovers in your life. 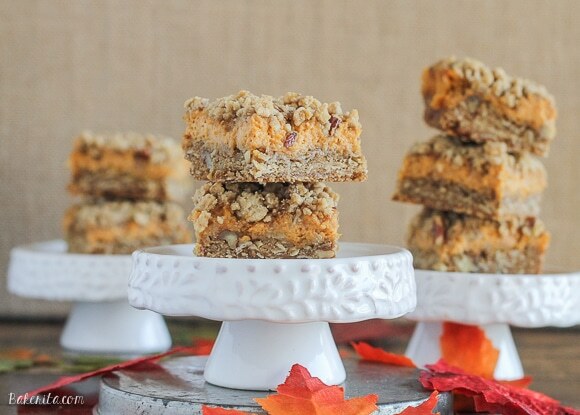 I haven’t met a batch of crumb bars that I didn’t like, and this fall-ready version is certainly no exception. With the rich, creamy filling and the spiced crumbly crust, these are your fall dreams neatly packed into an 8×8 pan. Now go make those fall dreams come true! Enjoy. Preheat oven to 350°F. Line an 8x8-inch pan with parchment paper or foil and grease lightly. In large bowl, combine all crust ingredients; mix at low speed until crumbly but combined. Reserve 1 cup of crumb mixture for the topping. Press remaining crumb mixture evenly into the bottom of greased pan. Bake at 350°F for 10 minutes. While baking, prepare the pumpkin cheesecake filling. Beat the cream cheese in a stand mixer for 1-2 minutes until very soft and creamy. Add the rest of the ingredients for the pumpkin cheesecake and mix until completely combined, about 1-2 minutes. Remove partially baked crust from the oven. Pour on the pumpkin cheesecake mixture. Top with remaining crumb mixture. Return to oven and bake for another 20-25 minutes or until bubbling and lightly browned. Let cool completely before cutting into 16 squares. In the past, I've had trouble getting cream cheese and pumpkin puree completely smooth - if things aren't at the right temperature, sometimes the cream cheese stays in little white balls. If this happens to you, pour all of the cheesecake mixture into a blender or food processor and puree for a few seconds until smooth before using. Oh yum! These sound fantastic! And I’m with you – I love it when recipes use the same for both the base and crumble topping! So much easier that way! 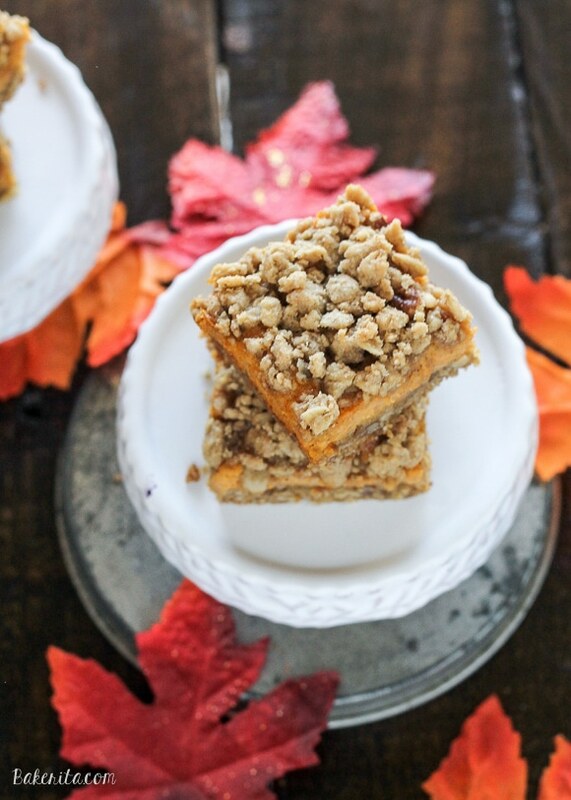 Crumb bars are always such a hit! I love that you added not only pumpkin but also cream cheese. Major yum! Ooooh yum! These sound magical. :) Definitely loving all the pumpkin lately. I need a Costco sized can!! And that crumble topping looks perfect! I have been making so many pumpkin recipes the past few weeks. I will have to try these, too. All my favorite fall things! :) Thanks, Kathleen.